out of the five shivalingas condecrated by Balarama along the bank of river Nagavali , this is the fourth one . 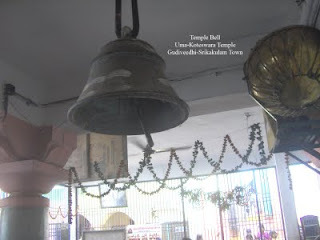 Iscriptions on the Utsava idols tell the tale that this temple was found during Salivahana era. From the great Puranas of Dwaparayuga, the following information is gathered. Balarama the brother of Srikrishna who is supposed to be the very incarnation of Lord Vishnu. 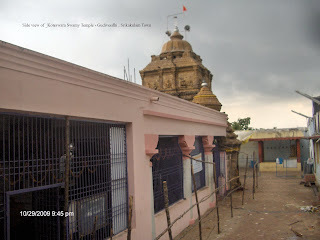 Balarama in Dwapariyuga was said to be disturbed due to the on coming Kourava versus Pandava Battle - the "kurukshetra Battle" and started on going for a pilgrimage tour towards eastern of kurukshetra ... on his way when he reached the are of Srikakulam he observed that the people are facing lot of trouble due to lack of water for irrigation and even for drinking . Due drought there were many antisocial activities like robbing , theafting , killings , for food & daily maintainence . . . and at the request of local people started " tapassu" (Praying God) for Lord Shiva. Soon he was Booned with water(ganga) from Shiva . From the place (Kalahandi in orissa) where he prayed , brought the river Nagavali along with the furrow of his tiller (plough). . and the river reaches the Bay of Bengal at Kallepalli Moga near MapasuBandaru village in Srikakulam dist . Balarama Consecrated a temple on the shores of the river Nagavali , that is the temple of Uma and Rudra Koteswara. All the Gods angels and their minions arrived on the shores of Nagavali and paid their obeisance to Lord Rudra . Indra, the Lord of Paradise was, some how late. By the time he arrived, it was late in the night, he tried to gatecrash his entry. 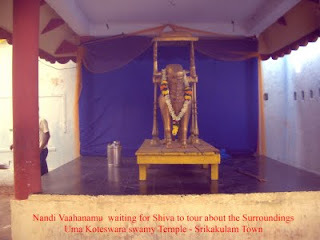 At the time, Nandiswara, the great Vahana of Rudra was keeping vigil at the gate. He did not allow Indra to go in, as it was time for Lord Rudra to rest with Mata Parvathi. Indra was adamant in his demand to enter the temple, infuriated by his perverse persistence, Nandiswara kicked him violently and sent him flowing in the air towards the eastern side. Indra fell unconscious in a painful state. Then it is said, he offered his prayer to the Sun God for relief of his body pains and exhaustion. The Sun God took pity on him, touched Lord Indra with his innumerable rays, and got back his strength and relief from pain. He was grateful to the Sun God who gave him back his strength and relief from pain. He begged the Sun God to allow him to stay there forever and spend his time serving the relief giving Sun God , then The Lord Surya directed indra to find out his idol in the ground where Indra fell down for worship . It was the Indra dug deep in the ground with Vajraayudam ... which later formed as Indrapuskarini , got the Surya idol , constructed a temple there in Harsavalli . (later called as Arasavilli) in srikakulam town. 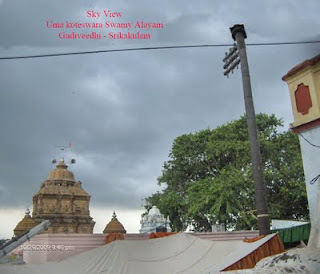 Uma Rudra Koteswara Swamy is a famous Shivalayam in this area . 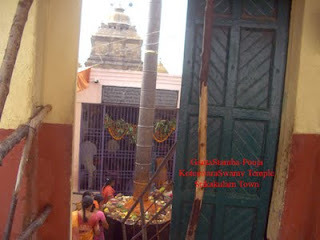 In Karteeka masam , the moth after deepavali this temple is busy with many devotees . On Mondays much more . On Mahasivaraatri it of great important . Your comment is important for improvement of this web blog . Thank Q !